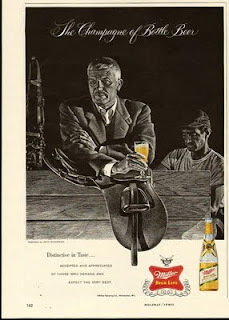 Well it's the first Friday for this blog and here we will start a theme, old ads for alcohol on Fridays. Anyone who lives in the US will instantly recognize Miller Beer Co, although the favored beverage from that company now is Miller Lite. Personally I think all lite beer is tasteless swill but de gustibus non est disputandum (to each his own). Miller has for years touted themselves as the "Champagne of Beers" although this ad lowers the notch a bit as it refers only to bottle beers. I'm not really sure what's going on here in this artwork as we have a ranch manager looking rather dapper in a Norfolk style coat leaning up on a fence enjoying a Miller after a hard day of yelling at the workers. We can tell he's the manager because there's none of that working class "drink from the bottle" nonsense for him, oh no he has his beer in a pilsner glass. The guy in the t-shirt behind him seems to be doing something with his hands and though the fence blocks our view, I've seen enough of "Brokeback Mountain" to know where this is going. While Miller used to be a "Foil Top Beer", the foil has long ago been dispensed with although the bottle art has changed little from the time of this ad. Surprisingly, Miller High Life is not a bad beer. It has just enough taste to be interesting and goes down smooth... too smooth according to my dad. In the world of mass produced beer of questionable quality, Miller High Life certainly shines above the rest as a paragon of the mundane in a sea of insipid brews. Cheers to all my readers, few though you may be. Have a good weekend and I'll be back on Monday.